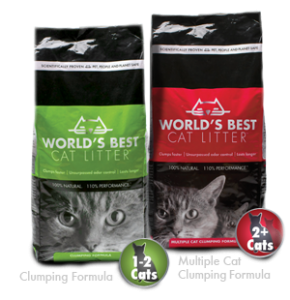 You can try World's Best Cat litter for free after rebate! Go here to print a rebate form. I have to say, I love this cat litter! It is the only thing that I use for my cat. It is made out of corn which has several benefits - it makes less dust, it is cleaner, more absorbent, clumps great, and it is FLUSHABLE!! I have the litter box in our downstairs bathroom and I love the fact that you can flush this litter right down the toilet with no mess taking out small bags of used litter every day. It is a little more expensive than other litter (a 7 lb. bag costs $6-8). 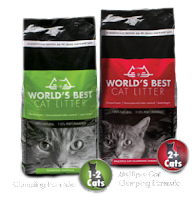 But I find that I can make 1 bag last for an entire month for my 1 cat, where if I use Tidy Cats or any other litter the smell is so bad that I have to change it after 2 weeks. Also often there are high dollar coupons offered in the paper or online for this litter so I usually can get it for $3-5 a bag and stock up for the next couple months.